​When you are making and creating, it is very valuable to share your creations with other people. In the 3D printing community, the most used tool for sharing your 3D designs and creations is a website called Thingiverse. Thingiverse is a great place to, not only share your Things, but to "remix" or customize other designs people have created. Thingiverse is a great tool with many uses. It's a good place to get ideas for new designs of your own or find objects that you can customize without having to design them from scratch. As you create your own designs, it's a good place to share them with others and get feedback. do with it. (Be sure to use Google Chrome with Thingiverse). 3. Take a few minutes to explore the site and get a feel for the environment. A lot of designers are moving to this site from Thingiverse (or putting a foot in both communities). 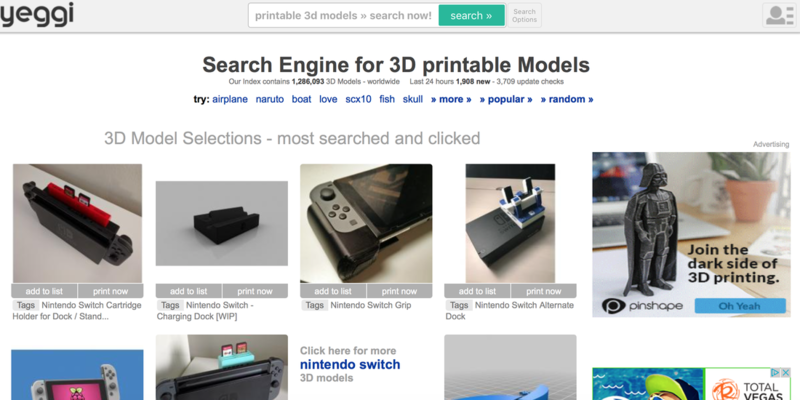 Yeggi is a search engine specifically for 3D printable models. When you enter a search term, Yeggi will scour the internet and return search results pulled from "all 3D communities and marketplaces that offer 3D models to print". This is a great way to find any design that someone has created, without having to separately search all of the communities and marketplaces that exist. Repables is a new alternative to Thingiverse. Billing themselves as a "3D printable file repository" they aim to provide a place where users can be a part of a open-source file sharing community and upload their designs to share with others. As a new community, Repables does not yet have nearly as many users or "things" as Thingiverse, but they show promise.